Read A Full Court Press Against Back Pain by Dr. David Richey to learn more about Accident & Injury Center and our Chiropractic office in Anchorage, AK. Back pain needs a good defense and offense just like a top-rated basketball team. Whether we are high caliber athletes or weekend warriors, it’s time to stop defending the backcourt and invest in the proper shoes to avoid future injuries. This way we can make the slam dunk of the season – without any lasting consequences. The majority of people choose fashion over function when purchasing athletic shoes. This need for style can often lead to poorly fitting shoes which will not only leave you with painful feet at the end of the day but pain throughout your body too. Because footwear plays such an essential role in the function of bones and joints, you choosing the right shoe can help prevent pain in your back, hips, knees, and feet. Unfortunately, there is no such thing as the perfect athletic shoe—every pair of feet is different, every shoe has various features, and overall comfort is a very personal decision. For this reason, it is best if you first determine your foot type: normal, flat, or high-arched. Below is a quick description of the various types of feet. Normal feet have a normal-sized arch and will leave a wet footprint that has a flare but shows the forefoot and heel connected by a wide band. A normal foot lands on the outside of the heel and rolls slightly inward to absorb shock.� Best shoes: Stability shoes with a slightly curved shape. This type of foot has a low arch and leaves a print that looks like the whole sole. It usually indicates an over-pronated foot—one that strikes on the outside of the heel and rolls excessively inward (pronates). Over time, this can cause overuse injuries.� Best shoes: Motion-control shoes or high-stability shoes with firm midsoles. These shoes should be fairly resistant to twisting or bending. Stay away from highly cushioned, highly curved shoes, which lack stability features. The high-arched foot leaves a print showing a very narrow band—or no band at all—between the forefoot and the heel. A curved, highly arched foot is generally supinated or under-pronated. Because the foot doesn’t pronate enough, usually it’s not an effective shock absorber.� Best shoes: Cushioned shoes with plenty of flexibility to encourage foot motion. Stay away from motion-control or stability shoes, which reduce foot mobility. When determining your foot type, consult with a chiropractor and their amazing team. He or she can help determine your specific foot type, assess your gait, and then suggest the best shoe match or suggest an orthotic to help keep your body in balance. Match the shoe to the activity. Select a shoe specifically for the sport in which you will participate. Running shoes are primarily made to absorb shock as the heel strikes the ground. In contrast, tennis shoes provide more side-to-side stability. Walking shoes allow the foot to roll and push off naturally during walking, and they usually have a fairly rigid arch, a well-cushioned sole, and stiff heel support for stability. If possible, shop at a specialty store. It’s best to shop at a store that specializes in athletic shoes. Employees at these stores are often trained to recommend a shoe that best matches your foot type (shown above) and stride pattern. Shop late in the day. If possible, shop for shoes at the end of the day or after a workout when your feet are generally at their largest. Wear the type of socks you usually wear during exercise, and if you use orthotic devices for postural support, make sure you wear them when trying on shoes. Have your feet measured every time. It’s important to have the length and width of both feet measured every time you shop for shoes since foot size often changes with age and most people have one foot that is larger than the other. Also, many podiatrists suggest that you measure your foot while standing in a weight-bearing position because the foot elongates and flattens when you stand, affecting the measurement and the fit of the shoe. Make sure the shoe fits correctly. Choose shoes for their fit, not by the size you’ve worn in the past. The shoe should fit with an index finger’s width between the end of the shoe and the longest toe. The toe box should have adequate room and not feel tight. The heel of your foot should fit snugly against the back of the shoe without sliding up or down as you walk or run. If possible, keep the shoe on for ten minutes to make sure it remains comfortable. When Should I Retire My Shoes? Once you have purchased a pair of athletic shoes, don’t run them into the ground. While estimates vary as to when the best time to replace old shoes is, most experts agree that between 300 and 500 miles are optimal. Most shoes should be replaced even before they begin to show signs of moderate wear. Once the shoes show wear and tear, especially in the cushioning layer, they also start to lose their shock absorption. Failure to replace worn shoes is one of the leading causes of injuries like shin splints, heel spurs, and plantar fasciitis. Our team wants to help you defeat back pain on and off the court of life. 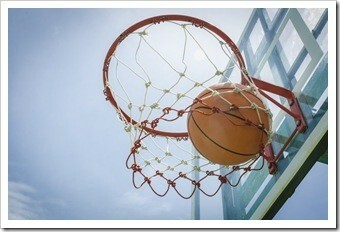 Call us and let us help you slam dunk a victory in better health!